This week, commodities were mixed, but all other asset classes were unchanged or lower. Bitcoin saw the largest drop, falling 9.5% to close at 159.1 grams after hitting a new all time high of 181.3 grams on Saturday the 4th. The largest gains were in coffee, which rose 1.5% for the week. The US Dollar was the weakest currency, falling 1.3% to 24.2 mg. The strongest currency was the Japanese Yen, which fell 0.5%. Long term bonds fell 2.5% while short term bonds dropped 1.4%. Both were outperformed by notes of zero maturity (USD cash). Bitcoin surged higher after the prior week's close, setting a record high of 181.3 grams over the weekend, then slid on Monday, rallied on Tuesday and Wednesday to 180.7 grams, then declined sharply on Thursday and Friday to close at 159.1 grams, down 9.5%. This decline continued to a low of 141.9 grams on Sunday, but reversed and began rising on Monday. Ethereum declined early in the week, reaching a low of 7.2 grams on Tuesday, then rallied to 7.8 grams on Thursday, but pulled back to close at 7.3 grams, down 3.5%. Stocks were mostly lower, led by the EURO STOXX, which fell 3.4%. The Japanese Nikkei was the best performer, up 0.1%. Gold stocks were the next-best, losing 0.8% for the week. The Dow Jones Industrials fell 1.8% to close at 567.2 grams. Coffee was the strongest commodity, rising 1.5%. Crude oil and platinum also rose, 0.6% and 0.3% respectively. Copper and silver were the weakest, falling 2.6% and 1.8% respectively. Palladium also fell, giving up 0.8%, but continues to be priced higher than platinum, an unusual state of affairs that I think will unwind eventually. The website recovery is coming along nicely, and most charts should be getting updates at this point. Please email me if you have a favorite that is stale and I will make sure it gets attention. Thanks for your patience! 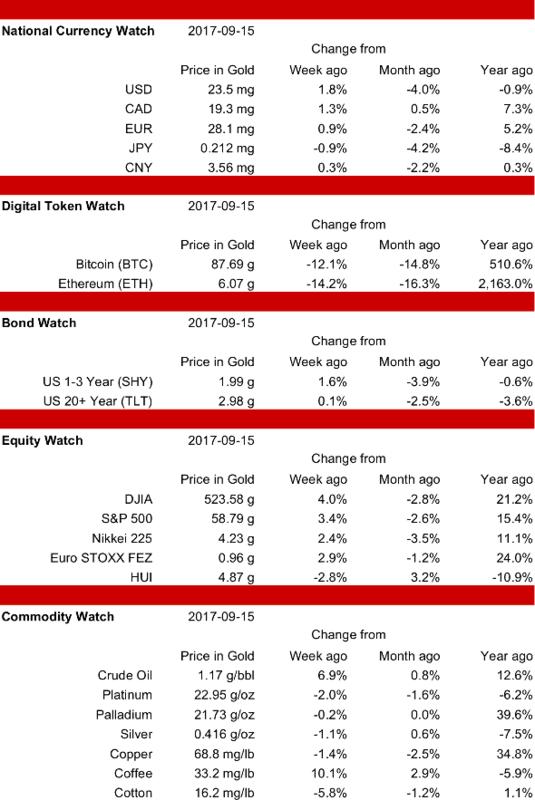 The week of 13-Oct saw stocks, bonds and currencies lower, digital tokens much higher, and commodities mixed. This week, stocks, bonds and currencies recovered some of those losses, commodities were again mixed, and Bitcoin rose to new all-time highs while Ethereum gave up all of the prior week's gains. The largest gains were in Bitcoin, which rose 7.6% (on top of the prior week's 25.3% gain) to close at a record high of 145.3 grams. Gold stocks had the largest losses, dropping 1.2% this week on top of a 2.6% loss the prior week. The US Dollar was strong this week, gaining 1.4% and recouping about half of the prior week's loss. The weakest currency was the Japanese Yen, which added 0.3%. Long term bonds were little changed (off 0.1%) while short term bonds rose 1.3% and notes of zero maturity (USD cash) gained 1.4%. Bitcoin worked its way higher over the last two weeks, setting a string of record highs, and closed this week at an all-time high of 145.3 grams, up 8.8%. Ethereum rose 8.3% to 8.1 grams on Friday 13-Oct, but dropped steadily this week, closing at 7.4 grams, down 8.8%. Stocks were higher, led by the Dow Jones Industrials, which rose 3.5% to close at 566.3 grams, a new 10 year high (more on this below). The Euro Stoxx FEZ rose 1.0%, the least of the major indexes. Gold stocks were the only falling equities, losing 1.2% for the week. Copper and crude oil were the strongest commodities, rising 2.5% and 2.2% respectively. Cotton was the weakest, falling 1.1%. Platinum was also weak, dropping 0.9%, and continuing to hover just above its all-time lows. US stocks, and the Dow Jones Industrials in particular, have been setting new record highs when measured in dollars. And they're doing quite well measured in gold, as well: they are up 157% from their 2009 lows and are now priced the same as they were exactly 10 years ago in October of 2007. But new all-time highs? Hardly! At 566 grams, they are 59% below their 1999 high of 1394 grams. This week I suffered a major computer crash that damaged the spreadsheet used to build many of the charts for the website (but thankfully, not the time series data itself). I am taking this opportunity to restructure the charting files to make updating and backing up easier. As a result, many charts will not get updates for a few days. Hopefully full service will be restored by next week. All asset classes were higher this week except for crude oil, which fell 3.0%. The largest gains were in Bitcoin and Ethereum, which rose 6.7% and 6.8% respectively. Platinum made new lows this week but closed up 0.7%, while palladium rose 2.8% to 23.25 grams per ounce, making it more valuable than platinum's 22.5 grams per ounce. More on this later. The Chinese Yuan was the best performing currency, rising 3.0%. The Canadian Dollar was the weakest, gaining 0.8%. Bonds rose again, and continued their bias toward the shorter maturities with the 20+ year TLT adding 0.7%, the 1-3 year SHY gaining 1.6% and notes of zero maturity (USD cash) rising 1.7%. Ethereum worked its way higher to close the week at 7.5 grams, up 6.8%. Bitcoin followed a similar pattern, closing at 107.7 grams, up 6.7%. Stocks were higher, led by gold stocks, which gained 4.6%. The Dow Jones Industrials were the best performing major index, rising 3.0%. The Euro Stoxx FEZ rose 1.5%, the least of the major indexes. Crude oil was the only falling commodity, giving up 3.0%. Silver was the next weakest, gaining just 0.1%. Copper rose the most, adding 4.3%. On Tuesday, platinum set a new all-time low of 22.2 grams, then rallied to close the week at 22.5 grams, up 0.7%. Palladium rose 2.6% to close at 23.25 grams, making it more valuable than platinum. Gold > Palladium > Platinum is a rarely (as in, never before?) seen arrangement for precious metals prices… The last time palladium was more expensive than platinum was in September of 2001, at which time both metals were significantly more valuable than gold. I think there could be a good long-term speculation in long platinum/short palladium as low platinum prices drive increased substitution for palladium in catalytic converters and other industrial applications. Currencies, bonds and major stock indexes were higher, commodities were mixed, and digital tokens stabilized this week. The largest losses were in coffee and silver, down 2.9% and 2.0% respectively. The biggest gains were in Ethereum, up 4.0%, and crude oil, which rose 3.7%. The Euro was the best performing currency, rising 2.4%. The Pound Sterling, which was a star performer among the currencies last week, gained a modest 1.7% this week. The Japanese Yen was the weakest, gaining 1.0%. Bonds rose again, with the 20+ year TLT adding 1.6%, while the 1-3 year SHY gained 2.0% and notes of zero maturity (USD cash) rose 2.2%. 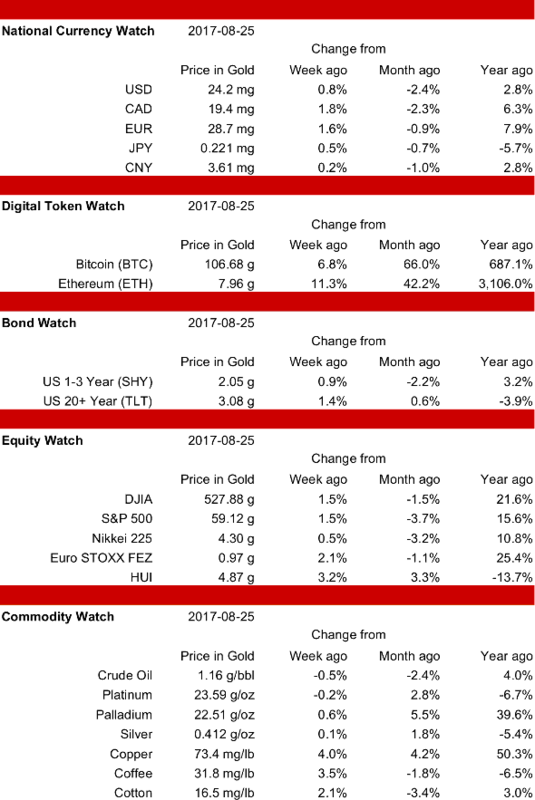 Ethereum rallied in the first half of the week, hitting a high of 6.7 grams on Wednesday, then pulled back to close the week at 6.3 grams, up 4.0%. Bitcoin followed a similar pattern, hitting a high of 96.4 grams on Tuesday, then drifting lower to close the week little changed at 86.6 grams, off 0.1%. Both BTC and ETH rallied over the weekend, with ETH trading at 7.0 grams and BTC trading at 94.5 grams on Monday. Stocks were higher, with the exception of gold stocks, which dropped another 1.5%. The Japanese Nikkei gained the most, rising 3.0%. The S&P 500 rose 2.2%, the least of the major indexes. Crude oil was the strongest of the commodities, rising 3.7%. Coffee fell the most, dropping 2.9%. Copper and palladium, industrial metals, were higher by 2.1% and 1.2% respectively. Silver was down 2.0% while platinum was off 2.1%. On Wednesday, platinum set a new all-time low of 22.4 grams, then rallied to close the week at 22.5 grams. Over the weekend, platinum continued to slide, closing on Monday at another new low of 22.3 grams. 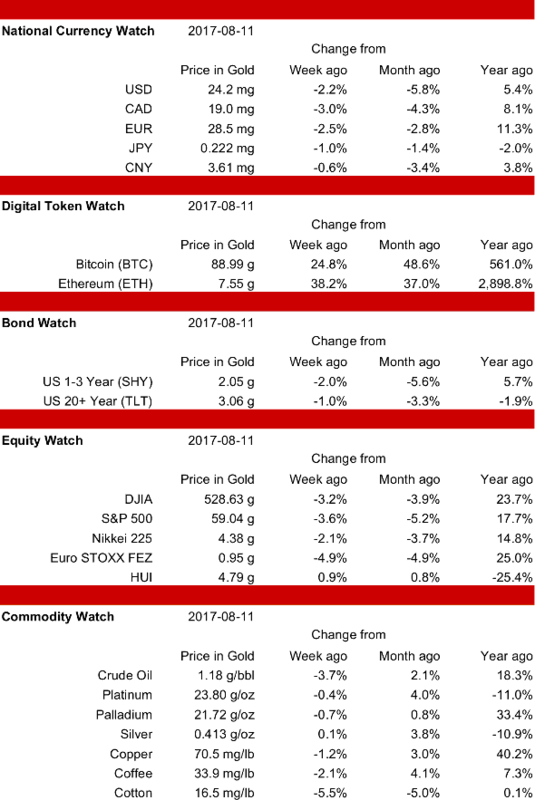 Currencies, bonds and major stock indexes were higher, commodities were mixed, and digital tokens fell hard again this week. The largest losses were in digital tokens, as Ethereum fell 14.2% and Bitcoin dropped 12.1%. The biggest gains were in coffee and crude oil, which added 10.1% and 6.9% respectively. The US Dollar was the best performing currency in this chart, rising 1.8%, but it was trounced by the Pound Sterling, which gained 4.9%. The Japanese Yen was the only declining currency, dropping 0.9%. Bonds were up, with the 20+ year TLT adding 0.1%, while the 1-3 year SHY gained 1.6%. Neither rose as much as USD cash, however. Bitcoin continued falling through most of the week, hit hard by an order from the Chinese central bank to close all cryptocurrency exchanges. After bottoming at 72.8 grams on Thursday, it rallied to end the week at 87.7 grams, down 12.1%. Ethereum followed a similar pattern, hitting a low of 5.2 grams on Thursday (47% below its all-time high), but recovered to close the week at 6.1 grams, down 14.2%. Both BTC and ETH continued to rally over the weekend, with ETH trading at 6.9 grams and BTC trading at 96.4 grams on Monday. Stocks were higher, with the exception of gold stocks, which dropped 2.8%. The Dow Jones Industrials gained the most, rising 4.0%. The Japanese Nikkei rose 2.4%, the least of the major indexes. Coffee was the strongest of the commodities, rising 10.1%. Cotton fell the most, dropping 5.8%. Crude oil was also strong, gaining 6.9%. Silver was down 1.1% while platinum was off 2.0%. 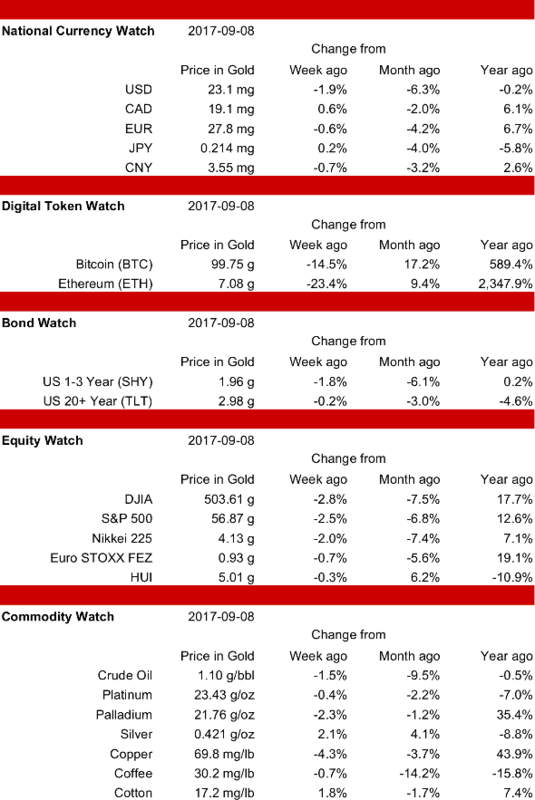 Currencies and commodities were mixed, while bonds, and stocks, and digital tokens were all lower this week. In a major reversal, the largest losses were in digital tokens, as Ethereum fell 23.4% and Bitcoin dropped 14.5%. The biggest gains were in silver and cotton, which added 2.1% and 1.8% respectively. The Canadian Dollar was the best performing national currency, rising 0.6%. The US Dollar fell the most, dropping 1.9%. Bonds were down, with the 20+ year TLT falling 0.2%, while the 1-3 year SHY dropped 1.8%. Bitcoin set a new all-time high of 116.6 grams at the end of last week, but was hit hard by the Chinese ban on ICOs over the weekend, falling to 100.8 grams on Monday. It rallied into Wednesday, closing at 107.66 grams, then sold off to end the week at 99.8 grams, down 14.5%. Ethereum followed a similar pattern, ending last week at 9.2 grams, falling to 7.0 grams on Monday, recovering to 7.9 grams on Wednesday, and finally selling off to close the week at 7.1 grams, down 23.4%. Ethereum was hit harder than Bitcoin in part because its blockchain supports the smart contracts used by many of the new tokens covered by the Chinese central bank ban. Once the dust settles, I expect both of these tokens to exceed their old highs; I see this sell-off as an excellent buying opportunity. Stocks were down, but gold stocks fell less than the major indexes, dropping 0.3%. The Dow Jones Industrials dropped the most, falling 2.8%. The Euro STOXX were off 0.7%. Silver was the strongest of the commodities, rising 2.1%. Copper fell the most, dropping 4.3%. Crude oil was also weak, falling 1.5%. Palladium was down 2.3% while platinum was off just 0.4%. 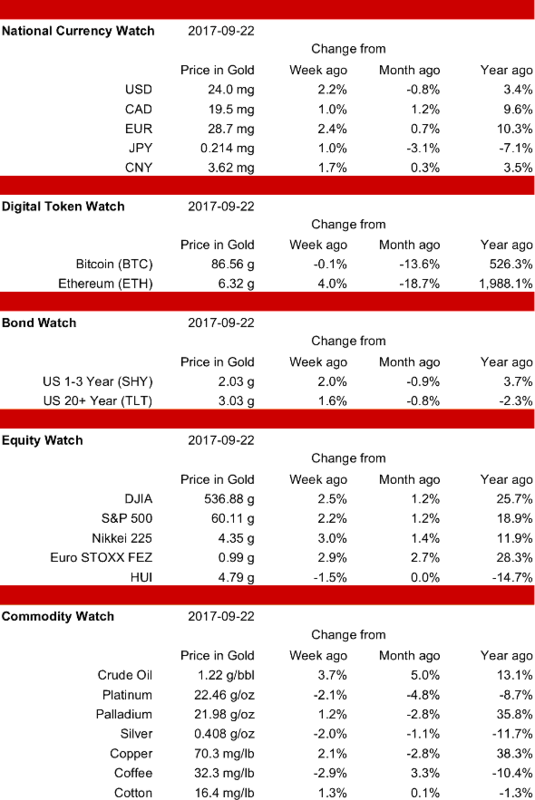 Commodities were mixed, and digital tokens were very strong, but bonds, currencies, and major stock indexes were all lower this week. The largest gains were in digital tokens, as Ethereum rose 16.1% and Bitcoin gained 9.3%. Gold stocks were also strong, adding 3.1% for the week. The biggest losses were in coffee and crude oil, which dropped 4.4% and 3.8% respectively. The Chinese Yuan was the best performing national currency, only falling 1.1%. The Japanese Yen fell the most, dropping 3.2%. Bonds were down, with the 20+ year TLT falling 3.1%, while the 1-3 year SHY and USD cash (notes of zero maturity) dropped 2.7% apiece. Bitcoin rose each day to close the week at 116.6 grams, up 9.3%, and setting a new all-time high. Ethereum followed a similar pattern, ending up 16.1% at 9.2 grams, just 6.3% below its all-time high. Over the weekend, however, an earthquake hit the cryptocurrency world as the Chinese central bank announced a ban on ICOs (Initial Coin Offerings). This has sent many digital currencies tumbling, especially Ethereum, upon which many of the new tokens are built. On Monday the 4th, Ether was trading just below 7 grams, down 24% from Friday's close. Bitcoin was less affected, dropping about 14% over the weekend. With the US SEC proposing to regulate many tokens as securities, and China imposing an outright ban, many blockchain companies are looking to relocate to Switzerland or the UK, where regulators are taking a more crypto-friendly stance. Gold stocks outpaced the major indexes, gaining 3.1%. All of the big indexes fell, led by the Euro STOXX, which dropped 2.8%. The S&P 500 fell the least, down 1.3%. Cotton was the strongest of the commodities, rising 2.7%. Coffee fell the most, dropping 4.4%. Crude oil was also weak, falling 3.8%. Platinum and silver were little changed, off 0.3% and up 0.1% respectively. Almost all asset classes were higher this week, with the exceptions of crude oil and platinum, which dropped 0.5% and 0.2% respectively. The largest gains were in digital tokens, as Ethereum rose 11.3% and Bitcoin gained 6.8%. Copper was also strong, adding 4.0% for the week. The Canadian Dollar and the Euro were the best performing national currencies, rising by 1.8% and 1.6% respectively. The Chinese Yuan was weakest, gaining just 0.2%. Bonds were up, with the 20+ year TLT rising 1.4%, the 1-3 year SHY adding 0.9% and USD cash (notes of zero maturity) gaining 0.8%. Bitcoin spent most of the week trading near 100 grams, then moved up to close the week at 106.7 grams, up 6.8%, and just 1.4% below it's all-time high. Ethereum rose gradually throughout the week, ending up 11.3% at 8.0 grams, it's highest level since June. All equities rose, but gold stocks outpaced the major indexes, gaining 3.2%. The best of the big indexes was the Euro STOXX, which added 2.1%. The Nikkei was the weakest, rising 0.5%. Copper was the strongest of the commodities (up 4.0%). Crude oil fell the most, dropping 0.5%. Coffee recovered a bit from the prior week's massive 9.4% drop, rising 3.5% this week. Platinum and silver were little changed, off 0.2% and up 0.1% respectively. Bonds, stocks, and currencies were lower, but digital tokens and commodities were mixed. Bitcoin rose 12.2% while Ethereum dropped 5.2%. Coffee was the weakest asset class, falling 9.4%. The Canadian Dollar and Chinese Yuan were the best performing national currencies, off by 0.1% and 0.2% respectively. The Euro fell the most, dropping 1.1%. Bonds were lower, with the 20+ year TLT off 0.6%, the 1-3 year SHY losing 0.8% and USD cash (notes of zero maturity) dropping 0.7%. Bitcoin rose to a new all-time-high of 108.1 grams on Wednesday the 16th, then pulled back to close the week at 99.8 grams, up 12.8%. Ethereum fell gradually throughout the week, ending down 5.2%. Considering that it was up 38.2% the prior week, this is a modest pullback. All stock indexes fell, but the Nikkei 225 was the weakest index, dropping 2.2%. The Euro STOXX was almost unchanged, off just 0.1%. The DJIA was off 1.6% while the S&P 500 fell 1.4%. Gold stocks were down 1.5%. Palladium was the strongest of the commodities (up 3.0%). Coffee fell the most, dropping 9.4%. Platinum and silver dropped 0.6% and 0.4% respectively. Most asset classes were lower, but digital tokens shot much higher. Ethereum rose 38.2% and Bitcoin gained 24.8%, continuing to rise after the successful Bitcoin hard fork on August 1st. Bonds, major stock indexes, and commodities were all lower. The Chinese Yuan was the best performing national currency this week, falling 0.6%. The Canadian Dollar fell the most, dropping 3.0%. Bonds continued to favor the longer maturities, as the 20+ year TLT fell 1.0%, while the 1-3 year SHY lost 2.0% and USD cash (notes of zero maturity) dropped 2.2%. Bitcoin rose all through the week, closing on Friday at 89 grams, a new all-time-high, and has continued to rise strongly since, trading at another new all-time high of 106.3 grams on August 14th. Ethereum followed a similar pattern, ending the week at 7.6 grams, a new high for the month, but still well below it's all-time high of 9.8 grams set on June 12th. Gold stocks gained 0.9% this week, but all the major market indexes were lower. The Euro STOXX was the weakest index, falling 4.9%. The DJIA was off 3.2% while the S&P 500 fell 3.6%. Commodities were all lower except for silver, which was virtually unchanged (up 0.1%). Cotton and crude oil fell the most, dropping 5.5% and 3.7% respectively.